Are facts under attack? We explore this question in the Autumn issue of Index on Censorship magazine. In the podcast, we speak to Academy of Ideas founder and director Claire Fox about why we need to leave our echo chambers; Tanzanian blogger Elsie Eyakuze discusses a current blogging tax in her country pricing writers offline, and journalist Dan Nolan talks of the dangers that currently face scientists in Hungary. Print copies of the magazine are available on Amazon, or you can take out a digital subscription via Exact Editions. Copies are also available at the BFI, the Serpentine Gallery and MagCulture (all London), News from Nowhere (Liverpool), Red Lion Books (Colchester) and Home (Manchester). 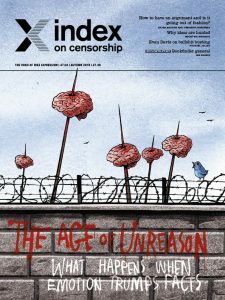 Each magazine sale helps Index on Censorship continue its fight for free expression worldwide.